We track every move that CMS and The Joint Commission make to help ensure survey success at your facility! 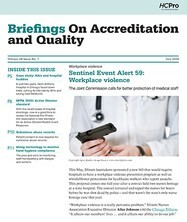 Briefings on Accreditation and Quality (formerly known as Briefings on The Joint Commission) is a monthly publication that provides you with the regulatory analysis you can trust to ensure a successful accreditation system at your facility! In addition to keeping you up to date on developments from CMS and The Joint Commission, this newsletter also provides tips and advice on quality improvement, case studies from your peers, best practices from other facilities, and field-tested tools and forms that you can easily modify for your organization. Subscribe today and rest easy knowing all the need-to-know information will be delivered to you every month!